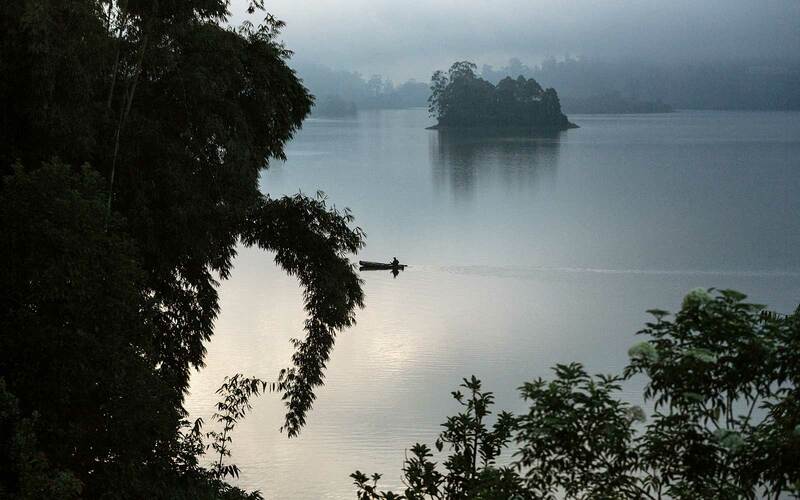 Early morning over Castlereagh Reservoir, in Sri Lankan tea country, as seen from a guest cottage at Ceylon Tea Trails. This island has something for everyone. That’s why, when it came time for her annual mother-son bonding trip, Janine di Giovanni decided it was time to plan a visit. Every year, my 14-year-old son, Luca, and I share a tradition. Around the time of his birthday, in February, we take an extended mother-and-son trip. The brief is that it has to be something educational, something fun, but, most of all, something bonding. Meaning that it has to be an experience we can talk about over and over, a time when we make memories. On our first trip, we learned how to scuba dive in the Maldives, exploring coral reefs and swimming with the most exquisite tropical fish; another year we explored Stasiland, in the former East Berlin, and learned about Cold War history. This year, we decided his birthday voyage would be to Sri Lanka. On this relatively small, diverse island, we could have three different holidays in one trip — an advantage more and more travelers are getting wise to, thanks to Sri Lanka’s ongoing postwar recovery. Luca and I both love to surf and swim in the ocean, and a friend who lives part-time in Galle, on the southwestern coast, told us the surfing beaches around there were some of the best she had ever seen. We could also visit tea country, high in the island’s mountainous interior, and learn about Sri Lanka’s colonial past. From left: The lobby at Cape Weligama, a high-end resort on Sri Lanka's southern coast; surfing in the Indian Ocean near the resort. And then there is the wildlife. Ever since Luca was small and I would read him The Jungle Book and Where the Wild Things Are, I have promised to one day take him on a safari. My work as a war reporter has meant spending long stints in Africa, and I remember so well the first time I saw giraffes in the open; the first time I waited in the cold morning mist to see a lion; the first time I woke to the smell of the damp earth and the animals, so close by. So when our Cessna light aircraft finally touched down about 45 minutes from Yala, we were primed. We stepped out of the plane into a blaze of heat and drove through a string of small villages, past schoolchildren in pastel-colored uniforms and stalls selling kaleidoscopic fruit and vegetables, until we reached our base camp: Wild Coast Tented Lodge. 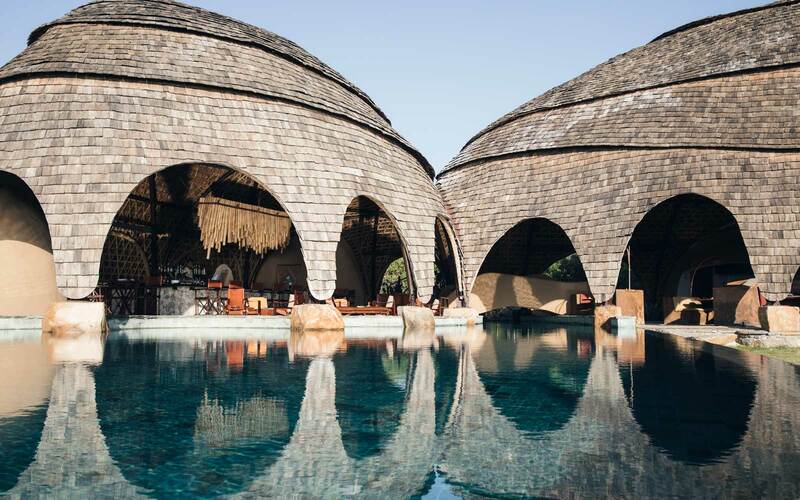 Wild Coast Tented Lodge, a new safari property on the southern coast of Sri Lanka. The resort, which opened last fall, is pretty spectacular. It consists of 28 cocoon-like suites bordered by the park on one side and the Indian Ocean on the other. A series of twisting jungle paths led us to our pod, where we found polished wooden floors, colonial-style furniture, and a freestanding copper tub. There was also a small front porch where we could sit and watch deer and exotic, colorful birds come to drink at a watering hole just a few feet away. The sea near Yala is too rough to swim in — the waves crash and break against a wall of rock lined with sea urchins, and we were warned against standing too close to the edge. (Our host, the genial Teddy Roland, told usthe story of a Chinese tourist who insisted on taking a selfie, fell onto the rocks, and had to be sent to the hospital to have sea urchin spines removed from her feet.) But it didn’t matter: the hewn-rock pool was so beautiful that we were happy to wash away the effects of our journey there. Teddy invited us for cocktails at a table he had set up at the edge of the ocean; I had one with fresh watermelon juice and arak, the local spirit, while Luca had a mock mojito. We ate fresh shellfish outdoors at a candlelit table and, later, fell asleep to the sound of waves. I had never been to Sri Lanka before, but in January 2005, when Luca was only 10 months old, I flew to Tamil Nadu in southern India to report on children who had been orphaned by the Indian Ocean tsunami, which had struck a few weeks earlier. Just a couple of hundred miles south of where I was posted, more than 30,000 Sri Lankans had died and 25,000 had been injured when the wave hit the island. It was yet another body blow for a country already decimated by the long and bitter war between the government and the Tamil Tiger separatists that would eventually claim around 100,000 lives. In 2009, the 26-year conflict finally ended with a government victory over the Tigers, and although there are still tensions between the Sinhalese, Tamil, and Muslim communities, the island has remained largely peaceful since. Today the country is in a good place: the damage wrought by the tsunami has been repaired, and the people are hopeful. Tourism waned during the war, but now visitors are flocking back to Sri Lanka’s isolated beaches, peaceful tea plantations, and extraordinary wildlife reserves. On our first morning at Yala, I was woken before dawn by birdcalls I had never heard before. Taking my coffee out on the porch as Luca slept indoors, I sat in the half-light and listened to a soundtrack totally distinct from those of my usual habitats of Paris and Manhattan. Later that day I learned how, in the minutes before the tsunami, there had been no birdcalls. “The animals knew that something was coming,” said our safari guide, a trainee environmental lawyer named Chandika Jayaratne. Most of the wildlife had fled to higher ground by the time the three giant waves struck Yala and flooded much of the national park — including a guesthouse where a group of 47 Sri Lankan tourists lost their lives. We didn’t have to stray far from Wild Coast to encounter Yala’s abundant wildlife. As we set off down the road toward the park that first morning, an elephant came plodding up to our jeep and nudged one of the side mirrors with his trunk, knocking it onto the ground, and stuck around long enough for our guide to grow antsy. “They are so much bigger in real life,” Luca whispered, as the animal finally lost interest and wandered away. 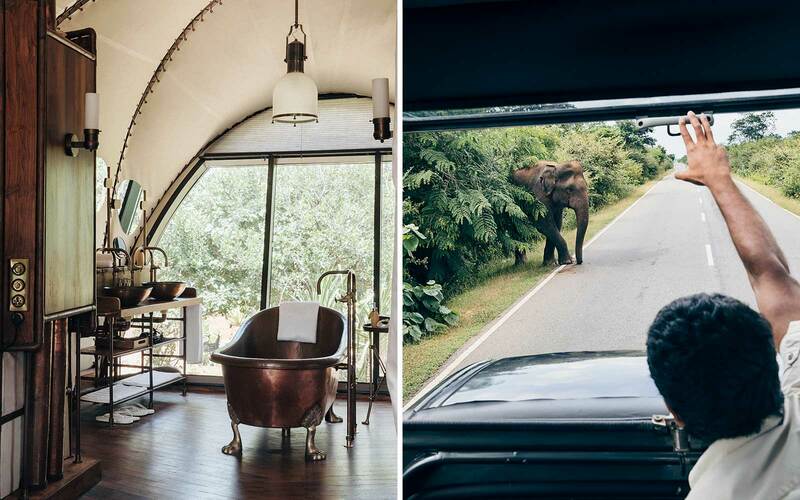 From left: A guest suite at Wild Coast Tented Lodge; elephant spotting in Yala National Park, near the lodge. Not everyone who comes to Yala sees a leopard, but we were lucky enough to spot one just an hour after entering the park. It came out from behind a rock, about 100 feet away. Majestic, arrogant, and ravishingly beautiful, it looked toward a row of jeeps from which tourists were filming the scene with their phones. The cat seemed completely unfazed by the crowd. “Does she know we are here?” Luca asked. “Oh, she knows, all right,” Chandika said. He had seen the leopard with its cubs the day before, so we waited for a long while for them to appear, but they did not. At lunchtime we drove back to the hotel, went for a swim in the pool, and began to prepare for the second part of our safari, which would take us to the rockier, more dramatic part of the park known as Block Five. Most visitors forego this area because it’s a longer drive from the park entrance, but we decided to go around sunset to see which animals might come out to eat and drink before dark. Midway through the safari, we got out of the jeep and ambled down a path to where Chandika and Teddy had laid out a surprise high tea in the middle of the forest, complete with a birthday cake for Luca. As monkeys scampered in the tree above us, hankering after our sandwiches, Luca told the Wild Coast team how he had been born in 2004 — the year of the monkey — so his father called him le petit singe, or little monkey. One thing we quickly learned was that the only way to appreciate the wildlife was to be patient. The more time we spent quietly watching and waiting, the more we saw unfold around us, like hidden tableaux. There were noble elephants, and an endless parade of peacocks, spotted deer, crocodiles, monkeys, and turtles — all of which Chandika seemed to know everything about. “If you are patient and open-minded,” he told us, “you will see wonderful things.” Chandika himself set a great example, giving considered answers to each of our questions — “What do peacocks eat?” “What runs faster, a leopard or a spotted deer?” — no matter how banal. We both felt sleepily content as we rose early the next day to drive to Cape Weligama, a beach resort on the southern coast owned by Resplendent Ceylon, the family-run firm behind Wild Coast Tented Camp. There we met Malik Fernando, whose father, Merrill, founded what would become Sri Lanka’s well-known Dilmah Tea empire in 1988. “We are a family of tea makers,” Malik told us over fresh ocean fish and vegetable curries that night. “But we are also accidental hoteliers.” Dilmah was the first producer-owned tea brand in the world, and the family’s hotels sprang out of a desire to show guests around the plantations. Ceylon Tea Trails’ five bungalows opened to visitors in 2005; then, in 2014, the family launched Sri Lanka’s most upscale beach resort. The beach near Cape Weligama. 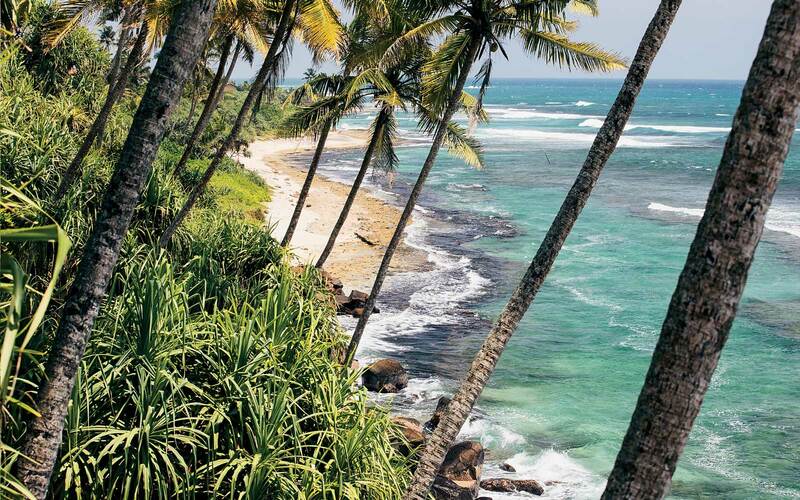 At this idyllic spot, which lies a little way along the coast from Galle, Luca and I spent our days in the Indian Ocean. I brought my son into the ocean with me when he was just a few weeks old, and as a result we share a love of the water. Out on those azure seas, we spent hours just swimming, floating, dreaming. We had our own bungalow with a private pool where the jealous monkeys who lived in our garden would come and steal our morning croissants. It was absolutely blissful. This part of the coast was once known for its stilt fishermen, who catch fish from perches several feet up above the ocean. Today, the locals mainly fish from the shore, though one morning, walking near the shallow ocean pools, Luca and I did see a group of men fishing the traditional way, balancing on stilts and launching their rods from high above the water. To see the third part of the Fernando family’s empire, we flew by seaplane to the town of Hatton in the province of Central Sri Lanka, where their Ceylon Tea Trails bungalows offer guests a taste of the life in the plantations. Hatton lies more than 4,000 feet above sea level, and when our plane touched down on Castlereagh Reservoir, there was a light mist hanging over the water. The surrounding hills were covered in lush overgrowth; here and there we could see women in pink saris bent over rows of tea bushes, picking leaves. This is where the finest tea in Sri Lanka is grown. From the mid 19th century onward, Ceylon tea was a staple of the British colonial economy. It brought enormous revenue to a small group of white planters, who lived in these hills in high style, retaining many traditions from home. The workers were mostly Tamils from southern India, who eventually made up 10 percent of the island’s population. As with many colonies, the workers’ lives were far less pleasant than their employers’. Luca, who has spent a great deal of time in Africa’s former French colonies, was particularly affected by the stories we heard of their plight. As we stepped onto the banks of the lake, Luca and I saw five bungalows perched over the water. Still reeling from the flight, we climbed the hill to Castlereagh, the bungalow where we were to stay. Our room overlooked the water; was fitted out with grand, antique furniture; and came with a butler, who brought us morning tea in bed, according to planter tradition (he also offered to draw my bath; I was too embarrassed to accept). The house was full of books and old National Geographics, and in the garden we found an idyllic shaded pool and paths leading out into the hills. We arrived a few days before Poya, the Sri Lankan Buddhist full-moon celebration, and in the evenings I would hear monks’ devotional chanting ringing out over the lake. At sunset the skies filled with strips of pink, lavender, and pale blue, and the air became chilly. Following another tea planter tradition, the butler would build fires in the sitting rooms in the evenings and hand guests single-malt whiskeys. Our days were lazy and restorative. One morning we trekked to the nearby Dunkeld Estate and watched how leaves were made into tea; another day we walked in the languid hills. Mostly we read, swam, and ate. The food was remarkable — especially the high tea served promptly at four, an English-style affair consisting of cucumber sandwiches, cream cakes, and scones. 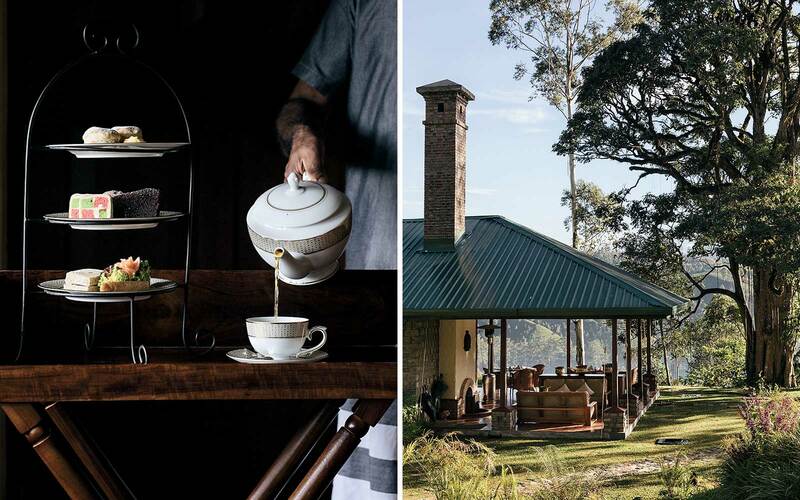 From left: High tea at Ceylon Tea Trails is served promptly at four o'clock; the Dunkeld Bungalow, one of five Ceylon Tea Trails cottages in the Sri Lankan highlands. On our way back to Colombo, we had planned to visit Diana de Gunzburg, my old friend who now lives part-time in Sri Lanka. Tired of the gray Paris winters, she picked up one day and bought an old tea plantation outside Galle. She plans to open an ayurvedic health center on the grounds. Diana gave us a tour of Galle’s old town, a labyrinth of tiny streets lined with shops selling spices, fabric, and religious trinkets. I bought nightgowns edged with lace as gifts for friends. “They look like something Stella McCartney would design,” Diana said. We bought coconut ice cream and climbed the fortress walls, following a group of schoolchildren with long braids down their backs. That night the Poya festivities came to a head, with worshippers flocking to their temples to receive blessings. Diana’s friend had arranged for us to go to his local temple, where we wandered through the grounds and met a young monk who wrapped our wrists with a white thread and prayed for our protection. We’ve only been back from Sri Lanka a few weeks, but I’m still wearing my white bracelet. Luca and I can’t stop talking about the trip. “Do you remember when we saw the leopard?” “Do you remember that monkey that hissed at me?” I keep looking back to the flight home to Paris from Colombo, the moment Luca and I climbed aboard the plane and squeezed into our seats, still full of the shared sensations of sunshine and adventure. I thought, even this, the voyage out, the voyage back, is going to be something we always share. 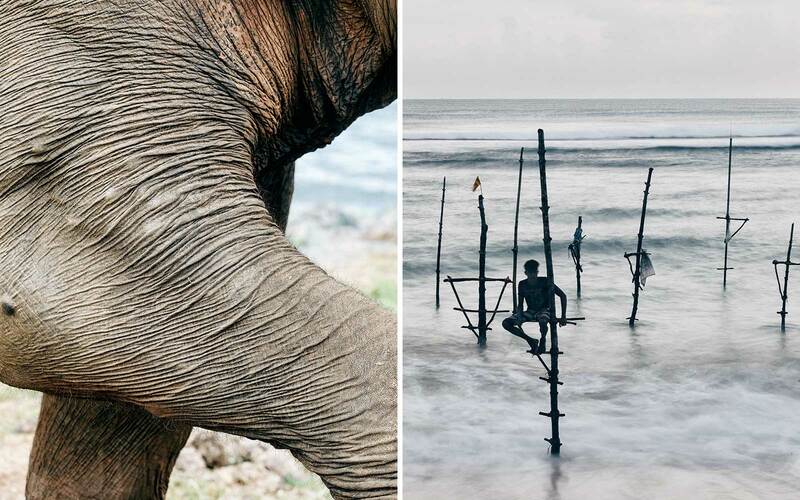 From left: An elephant near Yala National Park, which is also home to one of the world's largest concentrations of leopards; a stilt fisherman in the waters off Weligama, on Sri Lanka's southern coast. The easiest connections into Colombo (CMB) go through London, Delhi, or major Gulf hubs like Doha or Abu Dhabi. For the most part, we got around the country by air; car transfers are simple to arrange, but the winding roads can make short trips into hours-long journeys. Cinnamon Air offers air taxi transfers to cities and resort towns out of Colombo and Kandy. Book well in advance, as flights are in demand. We did the trip in the following order, but the locations can be switched according to your preference. Most international flights land early in the morning, so I suggest staying a day in Colombo to get your bearings. We stayed at the Shangri-La, Colombo (doubles from $180), which opened last year. The property has a lovely pool and a spa—the perfect place to get rid of the worst of your jet lag. This, and its excellent Sri Lankan restaurant, Kaema Sutra, landed the property on Travel +Leisure’s 2018 It List of the best new hotels in the world. The next morning, we took a seaplane to the tea plantations of Hatton. The trip is spectacular—after 40 minutes of staring out the window, mesmerized, you land on the emerald waters of the Castlereagh Reservoir. Our refuge there was Ceylon Tea Trails (doubles from $722, all-inclusive), a group of restored colonial bungalows in the hills of a working tea estate. We flew from Hatton to Yala National Park, landing about 45 minutes from the park on the island’s southern coast. Many properties in this lush region have been rebuilt since the 2004 tsunami, but the newest option is Wild Coast Tented Lodge (doubles from $445, all-inclusive). This beachfront collection of cocoon-like villas in the coastal jungle was also an honoree on T+L’s 2018 It List. From Yala we drove to Weligama in the southwest, a four-hour journey. The area has a number of boutique hotels and surf hostels; our choice was the immaculate Cape Weligama (doubles from $364), which, when it opened in 2014, was the southern coast’s first five-star beach resort. From Weligama, we made the short drive to Galle—a colonial fortress city that in recent years has become highly fashionable with international visitors and expats, who have brought with them juice bars, boutiques, and modern yoga retreats. Check out the fabrics, because tailors in Galle can make copies of favorite garments in local cotton and silk. The South Asia experts at Greaves Tours offer a range of Sri Lanka itineraries, including trips put together by advisors like Carole A. Cambata, who regularly appears on T+L’s A-List of top travel specialists (nine-day itineraries from $2,789). Pack plenty of mosquito repellent, sunscreen with a high SPF, and light, modest clothing for safaris and temple visits.